LG’s school is across the street from our house, and about a 5-10 minute walk from a local beach. Her teacher is truly wonderful, and planned a spontaneous trip to the beach. 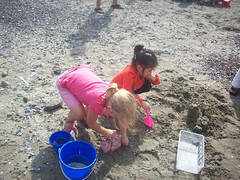 We packed up shovels & pails & tubs, and went down to collect shells and build sand castles! We worked on matching skills (collecting 10 each of blue mussel, littorina, and lady slipper shells), and then worked on the physics of molecular bonding and surface tension by making sand castles. 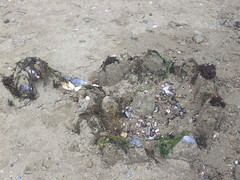 Apparently, as we determine how wet the sand needs to be to make the sand castle work, we are making many more connections than we realize consciously. The class was divided into groups of three, and they set to work on their castles. Some kids worked on their own, some worked together with the group. It was very interesting to see how they worked, and the questions the teacher asked to help their thinking. I’ve really enjoyed both field trips I’ve been on, and I’m loving learning the names and personalities of the other kids in LG’s class. They are all such sweet children, the teachers guide them gently, and the classroom is a very pleasant, welcoming place. I know I’ll be working soon, so I’m enjoying the field trips I can attend now!